As product designers we spend a lot of time trying to understand user friction and solve for it in the products we build. Doing so is absolutely critical to delivering delightful experiences for our users. I find though that sometimes teams are only perceiving and solving the most basic forms of user friction and aren't taking on some of the harder to perceive yet incredibly important higher level forms of friction that users are experiencing. So I wanted to share how I think about the hierarchy of user friction and provide examples and best practices for solving for each. User friction is really anything that prevents a user from accomplishing a goal in your product. 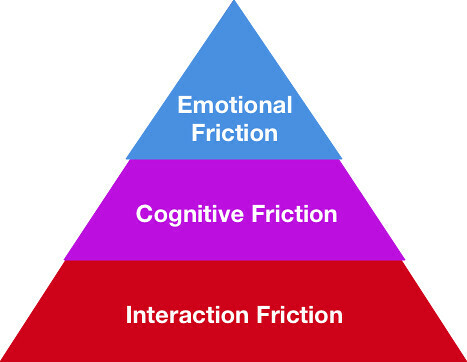 I categorize user friction into a hierarchy of three levels: interaction friction, cognitive friction, and emotional friction. Interaction friction is what I hear talked about most often amongst product designers, but the higher levels of cognitive friction and emotional friction are equally important to solve for to build a great user experience. Interaction friction refers to friction a user experiences when interacting with your product's interface. It covers all aspects of the UI that may be hindering your users from accomplishing their goal. We strive to build intuitive and consistent interfaces to prevent interaction friction. We ensure our call-to-actions are prominent, we reduce the number of steps or fields in our forms, we leverage style guide lines to ensure we have a consistent UX across all of our experiences, and we try to do the work for the user so they don't have to whenever we can. These are just a few of the techniques that are commonly used to address interaction friction. The canonical example of significantly reducing interaction friction remains the iPhone. Everyone knows that smartphones existed before the iPhone. We remember the days of the Blackberry or Windows Mobile devices that were technically email and web capable devices with a keyboard. And yet the iPhone changed everything. It was the first device to have a highly accurate on-screen keyboard thanks to their innovation in capacitive multi-touch screens. This freed up significant real estate on the screen when you weren't typing. They packed enough CPU power on the device to support a full web browser instead of the extremely limited web experiences that existed on smart phones before it. And most importantly, they made the entire software experience extremely intuitive, beautiful, and fast. And these improvements to the overall UX significantly reduced the interaction friction of every prior generation of smartphones and laid the groundwork for this new class of smartphone to become the predominant mobile device that everyone now carries around in their pockets. While the iPhone example illustrates how an entire industry can be redefined by solving for interaction friction, Amazon provides an example of how even the simplest of interaction friction can be a huge detriment to user experience. Amazon illustrates the incredible importance of site speed to online experiences. They found that they could increase revenue by 1% for every 100 ms of load time improvement. Think about that for a minute: such a small change in load time, 100 ms, could have such a dramatic impact on revenue for Amazon. It's a strong reminder that any type of interaction friction, especially page load time time, is important to address. The rise of messaging apps like Facebook Messenger and WhatsApp as well as Slack and HipChat in the enterprise can also be attributed to a significant reduction in interaction friction compared to the alternatives at the time, including email and text messaging. You no longer had to worry about whether you had someone's most recent email address or phone number. You didn't have to think about coming up with a subject line. You didn't need to use many of the formalities that people had become accustomed to with email, including greetings and signatures. All of that was taken away and reduced to the simplest form a communication: find the person you want to message and simply start typing a message to them. We've taken this even further now with the use of emoji, which communicate far more in a single image than the alternative of having to type it all out. Usability testing remains one of the most important techniques for identifying sources of interaction friction in your product and addressing it. When you watch end users using your product you'll undoubtedly discover friction points that you hadn't anticipated yourself. It's important to continue to leverage this technique not just the first time you launch a product, but continually as you iterate as well. Cognitive load refers to the total amount of mental effort being used in working memory. When cognitive load is high when performing a task, it means there is significant cognitive friction. The product designers goal then becomes minimizing cognitive friction. Cognitive friction is broader than just interaction friction as it encompasses all aspects of the experience that result in mental effort. This is best illustrated through a set of examples. Uber has been incredibly successful not only because it delivers rides at a lower price, but it significantly reduces the cognitive friction previously associated with taking a taxi, bus, or really any form of public transportation. Previously when you wanted to take a taxi, for example, you'd have to find a cab company and their phone number. Then you'd call to schedule a ride and often be stuck calling a few times until the dispatcher took your call. Then they'd tell you they are sending someone but you could never really trust their time estimate, so you'd often call the dispatcher back just to make sure the taxi driver is coming. This resulted in significant anxiety around whether you would get to your destination on time. You'd then get in the taxi and be wondering how much the ride was even going to cost you and at the end of the ride have to deal with paying with either cash or credit and tipping the driver. Uber solved all of the cognitive friction throughout this user experience by creating an incredibly simple app to request a ride, get an accurate estimate and real-time details of how far your driver was, provide a detailed price quote, and make payment completely frictionless so you can just walk out of the car. Nuzzel is another great example of an app that has removed significant cognitive friction from my use of Twitter. Twitter can be an incredible resource for professionals to stay on top of recent news & articles around their specific industry. You can accomplish this by following a set of thought leaders and peers in your industry and then read your feed to come across such industry news. However the Twitter experience has significant cognitive friction in accomplishing this goal. Since Twitter provides a real-time feed, you need to either check it constantly or spend a lot of time reading through older tweets to stay on top of it. And then you have to remember if you've seen a previous article several times to get a sense of popularity. The whole experience is pretty painful if your goal is staying on top of industry news. That's where Nuzzel comes in. It reads your Twitter feed for you and provides you an always up-to-date summary of your Twitter feed, showcasing all the articles that have been shared on Twitter sorted by the number of people who shared the articles and what each of the people you are following said about the article. Now I can spend just 5 minutes reading Nuzzel instead of tons of wasted time on Twitter to accomplish my goal. Nuzzel saw all the cognitive friction that existed to accomplish the goal and created a solution specifically around it. Wealthfront has done the same in terms of reducing cognitive friction when it comes to investing. Investing can be an incredibly daunting task. Even if you decide on a passive index fund approach, you still need to decide which indexes to invest in. S&P 500? Total market? Emerging markets? Bonds? Once you decide on the specific funds, you need to pick your actual allocation across asset classes. How much exposure do you want to domestic vs international stocks? What percentage equity vs bonds do you want to have? And ideally you should be thinking about adjusting this allocation based on your appropriate level of risk, which may change over time as your circumstances change. And you know your supposed to rebalance these allocations as your exposure to each asset class changes with actual returns, but you always forget to. Wealthfront solves for every part of this cognitive friction, reducing it to a simple questionnaire to understand your risk tolerance and then taking care of absolutely everything else: index selection, asset allocation, rebalancing, and more, automatically for you. This not only makes it so investing is easier for those participating, but frankly gets more people to invest in the first place instead of just leaving their money in cash because it's become so much more accessible with all of the usual cognitive friction removed. An effective tool for thinking through cognitive friction is building detailed user journeys of the entire current experience the user goes through to accomplish their goal, including all aspects of that journey, regardless of whether it's currently serviced by your product or not. When you are able to detail each and every step and understand what's painful, frustrating, or just time-consuming about it, then you can start to brainstorm opportunities for your product to directly address the cognitive friction you have now identified. The final category of user friction is emotional friction, which refers to emotions your users feel that prevent them from accomplishing their goal. These are often the most difficult to perceive and equally the most difficult to address. Let's take a look at a few of these in practice and how product designers ultimately solved them. Patreon is a platform that enables creators of anything (music, blog posts, journalists, comics, etc) to run a membership business for their fans. They have now reached over 1 million monthly active Patrons and pay over $150 million per year to creators. When they were optimizing their overall on-boarding experience for creators, they initially solved for much of the typical interaction friction in the flow, simplifying the on-boarding, providing more detailed explanations, making their pricing far clearer, and more. But when they really dug into understanding their customers, they finally uncovered that one of the main reasons creators don't actually go on to create a page is they are hesitant to look like they are begging their fans for money. They absolutely love what they do and they love their fans and it's a very real emotional fear they have that they will alienate their audience by simply asking them for money. Once Patreon realized this emotional friction, they were able to get to work on solving it. And the tactic that worked best for them was showing the user other respected creators in their field who are successfully using Patreon with their fans. Once they see others asking for money and getting their fans to do it successfully, they usually lose their hangup over it. Tinder is another great example of an app that solved for emotional friction in the world of online dating. With the previous generation of online dating experiences like Match.com, it was an incredibly intimidating experience that required you to put a ton of effort into an online profile, spend significant time searching for potential matches based on pics, interests, age, location, and more, and finally reach out to them. Reaching out to someone when you have no idea whether they have any mutual interest is as nerve-wracking of an experience as it gets. And the constant rejection can be incredibly discouraging. Tinder simplified the whole experience by reducing it to a series of profile cards that you simply swiped right if you were interested. If two people swiped right on each other, then their is mutual interest and then you have the ability to start a conversation. Tinder co-founder Sean Rad's core insight was that no matter who you are, you feel more comfortable approaching somebody if you know they want you to approach them. Tinder took on the emotional friction of online dating head on and made it far more approachable by developing a light-weight mechanic for quickly determining mutual interest. Over the last few years Facebook has struggled with it's own challenges of emotional friction resulting in the percentage of unique sharers on it's platform declining over time, especially amongst younger audiences, including teens and college students. These folks started sharing less for a variety of reasons, but largely because the bar for sharing on Facebook felt to them like it had gotten so much higher. They needed to showcase the very best of themselves to their friends and family. They were far more self-conscious about their sharing, especially since they had more and more friends on Facebook, including family, and the ability for anyone to easily find their profile. This emotional friction to sharing became a core focus for the team to solve. They launched a ton of new experiences attempting to address this, including Poke, Slingshot, Camera, Moments, and more. But none of them got any meaningful traction. All the while Snapchat grew its traction amongst the specific users Facebook was losing with a new core mechanic around Stories, which were short ephemeral photos and videos that you could share with your friends. And the crucial aspect was that they were self-deleting, which significantly reduced the bar to share and solved for the emotional friction associated with Facebook sharing. Ultimately Facebook realized that this was a far better approach to solve for their own emotional friction and adopted the same Stories mechanic across many of their apps. Truly understanding the emotions of your users takes in-depth user interviews often out in the field where your users are and spending time getting to really know them, their aspirations, their goals, their frustrations, and encouraging them to share their emotions associated with your product experience. This is not a simple user research task. But necessary if your ultimately going to solve for the emotional friction that might ultimately be holding your product back from it's full potential. I hope this provides you an overview of the hierarchy of user friction across interaction friction, cognitive friction, and emotional friction, and gives you the tools to understand and solve for each type of user friction in your own product experience.